For years, I kept the idea of visiting Lily Dale, a spiritualist community, located in Chautauqua County, New York, alive in my mind. One day, I decided to take the idea and turn it into a reality. I made hotel arrangements, packed a few items, and headed north. With a map in my hand and a full tank of gas, I was ready to commence my journey. The trip was lengthy and exhausting. It took me approximately eight hours to get there. I made several stops along the way always anticipating the arrival to my final destination. When I reached Chautauqua County, I drove a few miles until I came across a sign that said Lily Dale. After a long drive, I was finally there. I made a turn into a side road and drove straight ahead. On one side of the road were a few houses; while on the other side was a lake. 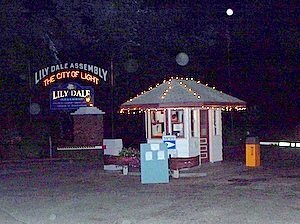 When I reached the end of the road, I saw a booth with a large sign on the side that said Lily Dale Assembly-The City Of Lights. I drove up to the gate and was greeted by a friendly young man. “How are you today? How long do you plan on staying?” he asked. “A week,” I replied. He told me the price and gave me a pass. As I drove into the spiritualist community of Lily Dale, I was struck by the vast difference between the inside and outside of Lily Dale. On the other side of the gate, the atmosphere felt dense and charged, while inside Lily Dale the ambience was serene. As I drove to the Maple Hotel, I noticed several well-preserved Victorian style houses. Everything around looked impeccable. When I arrived at the Maple hotel, I checked in immediately and went to my room. Besides a newer bed and curtains, it appeared that nothing had changed since its inception in the 1800’s. As I was walking down the stairs to commence my exploration of Lily Dale, I met a Latina woman who had been a medium since childhood. For some particular reason, we became inseparable during my stay there. Recently, the reason why we connected so well was made known to me. She was a stepping-stone that spirits had placed in my path to connect me to the next level of my spiritual journey. Never discard people that come into your life for a short time. It is possible that they are placed in your path to help you see something that you have missed along the way. "What do you mean by not so bad?" I asked her. “It’s the second floor you need to stay away from. There is too much spirit activity up there. The first time I came here, they gave me a room on the second floor. I could not sleep because of all the spirit activity in the room. I ran downstairs and requested another room. I did not go up to the room to get my belongings until the following day,” she said. When it was time for me to go to my room, I was a bit nervous. After hearing all those stories and confirmations from other guests, how could I not be scared. When I got to my room, I sat on the bed thinking about all the stories I had just heard. I got ready for bed, but could not fall asleep. I kept expecting some strange unfamiliar spirit to appear in front of my bed. I kept praying and hoping nothing would happen. Suddenly, I felt the energy of my mom enter the room, approach me and kiss me on my cheek. The sensation felt so real to me. After that, I fell asleep immediately. When I opened my eyes, it was morning and the rays of the sun had entered my room. From that day, I did not experience fear or discomfort. During my stay at Lily Dale, I enjoyed its many attractions - ghost walk tour, museum, library, Leolyn woods, fairy trail, healing temple, bookstores, shops, pet cemetery and much more. Moreover, I attended a few interesting workshops. My stay was quite pleasurable and noteworthy. The ghost walk tour is a must for all individuals visiting Lily Dale. Besides providing the history of Lily Dale, the tour includes visiting meaningful landmarks. The tour is conducted at night, which makes it more interesting and mysterious. Since numerous people attend these tours, the group is usually divided into two. The group leaders are people who are part of the community and well informed. Since the area is so dark, a flashlight is supplied to everyone. The last part of the tour is the stump area located in the middle of the Leolyn woods. People in the 1800’s would gather around the stump area to give and receive messages from departed spirits. It is said that the stump area is spiritually charged. Upon arriving at the stump area, the group is directed to sit on one of the many benches located there. In the middle of all the darkness, messages from spirits are received and given. An interesting and humorous story concerning the tour was told to me. As usual, the group was divided into two. The first group had completed most of the tour and was sitting around the stump area listening to spirit messages given by a medium. It was so dark that the medium decided to use his flashlight to illuminate his face so that people could see where he was standing. When the second group arrived, they saw what seemed to be a head floating in mid air. Without attaining the proper explanation, many ran away screaming. They though it was the head of a ghost. If you are looking for a spiritual adventure, Lily Dale is definitely the place to visit. Spirits are eagerly waiting for your arrival.